A two night stay at The Ice House for 2 with breakfast, one evening meal, spa treats & late check out. With this exclusive offer from Rewarding Times and The Ice House in Mayo, this fabulous break for two includes a 2 night stay at The Ice House. 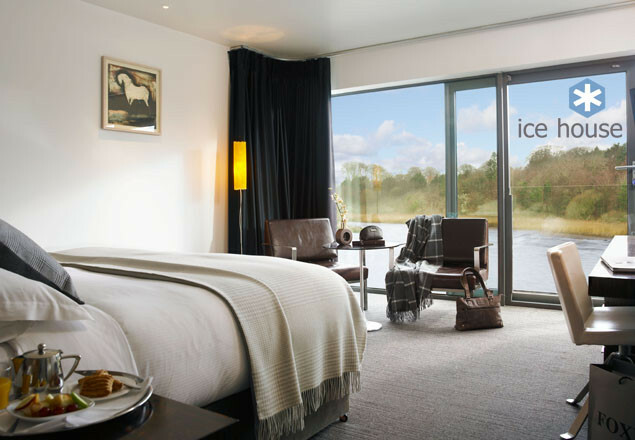 Enjoy a gorgeous deluxe river-view room with king sized bed, goose down duvet and amazing panoramic views of the River Moy, cooked to order breakfast, a delicious 3 course dinner prepared by chef Anthony Holland one evening, pre-dinner Prosecco, a spa credit and the warmest of Irish hospitality. Before dinner you will enjoy a glass of Prosecco each to get you in the mood for a delicious 3 course dinner in the riverside restaurant, using the very best local ingredients. Each morning awake to stunning views and The Irish Times waiting at your door! Also included in this wonderful offer is €25 credit each for Chill Spa, valid for any 60 minute (or longer) face or body treatment. With five luxury treatment rooms, thermal suite and an outdoor spa garden featuring hot tubs and a cedar barrel sauna, Chill Spa is a haven of tranquility and relaxation. Winner of best boutique Spa and best therapist at the Tatler Spa Awards 2014. Take your time on departure with a late checkout (1pm). Plus, enjoy 10% off at Foxford Woollen Mills, only a short drive from the Ice House. 10% off at Foxford Woollen Mills. Available 7 days a week from January 3rd to March 24th 2016. Limited availability Friday and Saturday nights. Certain dates excluded – February 12th-20th and March 17th 2016. Price is for 2 people sharing a deluxe river view room. Extra night available for €99 per room B&B directly from hotel. Saturday night supplement of €50 per room payable directly to the hotel.